The Wirrina Bluegrass and Acoustic Roots Festival is an annual gathering for people to hear, play and share acoustic music from the Bluegrass, ‘Old Timey’ and other related traditions. Bluegrass is great music. That’s why it heads up our festival. Our stage attracts world-class musicians; many come back each year to perform, to run workshops, and to join in the fun and inspiration of all that a Wirrina festival is. The 2018 Wirrina Bluegrass and Acoustic Festival was a great success! We applaud all the musicians who provided us with the opportunity to immerse ourselves in their wonderful creations. The music was—once again—exciting, skilful, inspiring, beautiful, at times sublime, and of a world-class calibre. We are very lucky to attract such fine musicians to our great little festival! A huge thank you to all who ventured down the coast to join in the music, the workshops, the connections with other music lovers, the revelry, and the joy that is a Wirrina festival. Thank you to the organising committee, who volunteer throughout the year to do what needs to happen to get the festival up and running. And thank you to the wonderful volunteers who set up the stages, put out the chairs, collect the rubbish, staff the festival ticket box, check arm bands, and do a myriad of other necessary tasks. The festival wouldn’t happen without you. A very big thanks to our hosts, Ben and Holly of the Wirrina Cove Holiday Park, for once again providing the site for the festival. And for cooking breakfasts, lunch and dinner, making coffee, serving beverages, tending to a million requests, and for being such friendly and generous supporters of the festival. The later festival date was successful in that we avoided a spring deluge that has featured at some previous festivals. As such the committee has voted that we keep the festival in November for 2019. The next Wirrina Bluegrass and Acoustic Festival will be on the weekend of November 22 to 23, 2019. Applications are now open for the 2019 festival and will close at the end of May. We are very keen to organise the program well in advance in order to effectively promote the festival. Visit the Apply to Play page for information. There are a variety of ways to participate in the festival. Volunteer on the festival crew; six hours of service = one free festival ticket! There are plenty of opportunities to perform on the walk-up stage at a Wirrina Festival. Put your name on the blackboard list when you arrive. Two to three songs are generally allowed although the MC of each session will use their discretion. There will be jamming around the fire pits, in the dining room, and in the session tent throughout the festival. Come along! In 2017 we asked patrons to spare a thought for the environment and the volunteers who clean up after the festival. Thank you for helping us to reduce the rubbish. Lets keep up the great effort in 2018! Reduce, reuse, recycle. The Festival mugs and wine glasses were a great success in 2017. There was far less garbage to deal with—such as plastic cups and single-use disposable coffee cups. 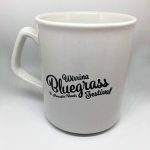 Be sure to buy your Festival mug and wine glass from the office in 2018.